As I watched “Easy Virtue,” I looked for the terrible title Hitch referred to in this quote, and frankly I didn’t see anything that bad – so he may have been thinking of another movie or something like that… either way, the titles in “Easy Virtue” didn’t stand out one way or the other. Adapted from a play by Noël Coward, “Easy Virtue” was released in 1928 by Gainsborough Pictures and starred Isabel Jeans as Larita Filton. The film opens on her divorce trial, and as we quickly learn, her husband is suing her for divorce after finding her in the arms of the artist he had hired to paint her portrait. Hitch cleverly switches the scene from the trial to a flashback – when the barrister (played by Ian Hunter, back for his third Hitchcock film) asks about a decanter of wine, the camera zooms in on the decanter. Then, when it zooms out again, the decanter is held by Larita’s soon-to-be former husband, who’s pouring a drink in the artist’s studio. After the divorce is granted, Larita flees the press waiting outside the court and heads for to the south of France, where she quickly meets young tennis player John Whitaker. Whitaker falls for her, and asks her to marry him. Before she says yes, she asks him how he can propose marriage when he barely knows her. He answers that he loves her, and that’s all that matters – words that will come back to haunt him. Back in England, at the Whitaker’s country estate, Larita finds her fiance’s mother suspicious and cold – after all, the old lady had expected her son to one day marry his childhood sweetheart, a neighbor named Sarah. The mother considers Larita an interloper, and on the eve of a ritzy party, it comes out that Larita is divorced. The family – the mother especially – is scandalized, and insists that Larita stay in her room during the party. But Larita won’t acquiesce. She puts on her most exotic outfit and joins the party, to the dismay of Mrs. Whitaker. In “The Farmer’s Wife,” Hitch focuses the viewer’s attention at the start of the movie with a street sign pointing to “Sweetland Farm.” Here, he starts with a less direct image: a downshot of the magistrate’s head, barely recognizable in its heavy wig. As he looks up, into the camera, we see who he is, and what the setting must be. Just a few minutes later, Hitchcock revisits the visual trick of pulling an image into focus through someone’s glasses, last seen in “The Pleasure Garden.” Here, the magistrate puts a monocle in front of his eye to focus on Larita Filton; we see the out of focus figure of Larita, followed by the monocle, which reveals her to us. As strong as the visual storytelling of this movie is, there were also a few plotholes. Toward the start, it’s mentioned both that the artist made Larita the beneficiary of his will, and that he is now dead. I could almost understand the first part – the artist said he was crazy about Larita, so maybe he reworked his will, but the other part… less so. When Mr. Filton finds Larita in the artist’s arms, he goes crazy with jealousy. He threatens the artist, who backs into a corner. Filton moves in on him, and the artist pulls a gun out of his pocket and fires. If he’s been hit, Filton doesn’t notice – he keeps advancing on the artist, and starts beating him with a cane. After four or five blows, none of which look very serious, Filton collapses as a bobby enters the studio. So, are we supposed to believe that the artist died from that beating, while Filton survived being shot? I guess so… and that leads to one of the movie’s funnier moments. Hitchcock had little use for the police, and he shows it here by having the cop methodically question Larita, taking careful notes while Filton lies bleeding on the floor. Hitch does make a cameo in “Easy Virtue,” his first since “The Lodger,” wandering by Larita as she sits near the tennis courts. Still, as easy as it is to watch, “Easy Virtue” leaves Hitch little opportunity to tell his own kind of story. Our next movie, “Champagne,” continues in this vein. According to Facebook’s BBC America Shop page, this will be more faithful to John Buchan’s original novel than either the 1959 or 1978 movie remakes were, yet it’s still supposed to retain some of the flavor of Alfred Hitchcock’s 1935 classic. I haven’t seen the original movie version of “The 39 Steps” yet, and I don’t expect to get to Hitch’s film till sometime in May, so I will be recording this new production on Sunday. And that brings me to the point of this post. In May, I’ll be throwing the first ever “39 Steps Fest” here on “Alfred Hitchcock and Me!” I’m going to read John Buchan‘s original 1915 novel, watch the Hitchcock film version and the new production that’s on this weekend, and maybe even more – and there may be some surprises along the way. The 39-day countdown to “39 Steps Fest” begins here on April 7! Watch for updates coming soon! Alfred Hitchcock returned to the British stage with “The Farmer’s Wife,” his first picture of 1928, and after watching it, the reason it prodded him further along in working in cinematic terms may be that it is a rather talky movie, even for a silent. Featuring Lillian Hall-Davis, who also starred in “The Ring,” “The Farmer’s Wife” is a sweet, if predictable, adaptation of a stage play about a widower who seeks a new spouse. The picture starts as farmer Samuel Sweetland’s wife lay dying; soon after, we see his young daughter getting married, and Sweetland realizes that it’s time he took a new wife. He consults with his young, lovely housemaid, played by Lillian Hall-Davis, making a list of local, available women who suit his fancy. The list appears again and again through the film as Sweetland goes from one woman to the next, proposing marriage and being turned down. Of course, he isn’t the most articulate or romantic person, and so his proposals are, shall we say, lacking in finesse. Still, each woman rejects him for different reasons; one says she’s too independent, one says he’s too old, etc. Finally, just as he’s about to give up on women entirely, he realizes that his maid has been pining for him all along, and that she is the woman for him. The audience had to have seen that coming; his and her rocking chairs sit by Sweetland’s fireplace, and in some of their conversations the maid even sits in the late wife’s chair. Although this isn’t a particularly great film, it does boast the presence of Gordon Harker, previously seen as the slow-witted trainer in “The Ring.” Here, he’s the aptly named Churdles Ash, a farmhand who disdains marriage and women in general. He’s pressed into service at one point at a party, where he must announce guests as they arrive while holding up his too-loose pants. Ash says he’s ashamed of his master’s behavior, and when Sweetland finally proposes to the maid, Ash promises to help her tame the farmer. “The Farmer’s Wife” is a fairly straightforward period piece, a romantic comedy that is filmed simply and with confidence, but with little of the inventiveness that would mark Hitch’s better efforts. One of the stronger sequences, at the beginning, attempts to show the passage of time in an odd way: In her dying breath, Sweetland’s wife mutters something to the maid about remembering to “air your master’s pants.” This is followed by a montage of pants being washed and hung out to dry, washing and hung out to dry, over and over. Not exactly Hitch’s most evocative moment. Fortunately, the movie has adorable dogs, and lots of them! Hitch loved dogs, and here there are dogs on the farm as well as swarms of beagles at the start of a fox hunt. The other morning I saw a great example of Alfred Hitchcock’s filmmaking mastery. Before I got out of bed, I turned on the TV, flipped to TCM and tried to guess what movie was playing. This morning, the movie was Hitch’s “Foreign Correspondent,” released in 1940 and starring Joel McCrea – not Hitch’s own favorite star, but one who I find pleasantly understated. Here’s what I saw: On the steps of a town hall, on a rainy afternoon, a well-dressed young man greets a much older man. The older man is confused; he doesn’t seem to recognize the young man. As the young man – McCrea – talks, a photographer joins them, carrying a large camera. He asks to take the old man’s picture. The old man smiles and poses and – BANG! The photographer shoots him square in the forehead. That’s when we see that the photographer was carrying a pistol hidden against the camera. We get a quick shot of the old man’s shocked face, covered in blood, like that famous shot from Sergei Eisenstein’s film “Battleship Potemkin,” and then he collapses. The photographer takes off into a crowd of people all carrying umbrellas; there’s a spectacular overhead shot of black umbrellas, and we track the killer’s path through the crowd as a ripple across the sea of umbrellas. He breaks out of the crowd, but McCrea is hot on his heels. The killer tries to get on a streetcar, then runs around the side of it and jumps into a waiting car. McCrea leans into another car driven by a man, with a woman passenger, and says something like, “Help me, please! That man just killed the mayor; we’ve got to catch him.” The people agree to help, and McCrea piles in. They take off after the killer. Now McCrea’s car is on the open road. There’s some very funny banter about the driver’s name – it’s ffolkes, two Fs, neither of them capitalized. The driver explains that his mother changed it to lower case to honor the memory of his father, who had been executed. The killer starts to shoot at them, cutting off the conversation. They speed through a suburb, where there’s a funny bit where an old man is trying to cross the road. He slowly takes a step into the street as the first car comes careening around a bend and straight at him, and he quickly retreats onto the sidewalk. Again, he starts to cross the street, but here comes McCrea’s car, and he beats it back to the curb. One more time – only this time he is chased back onto the curb by about a dozen police motorcycles. They emerge from the town into a countryside with windmills. The killer’s car is nowhere in sight. And that’s where I stopped watching. It couldn’t have been more than three or four minutes, but it was obvious to me that this was a Hitchcock picture, from the tip of the hat to Eisenstein to the marvelous visual gimmick of the umbrellas to the moments of humor amid the tension of the chase. Sure, the cars and fashions made it clear that the movie was from the 1940s, but it was Hitch’s style, from a visual and storytelling point of view. “Foreign Correspondent” was only Hitch’s second movie after coming to Hollywood, and his confidence and inventiveness as a director are abundantly clear. And it isn’t even considered one of his best movies! If you’re as interested in this film as I am, I’ll be writing about “Foreign Correspondent” in depth early in July. 1927 was a busy year for Alfred Hitchcock. 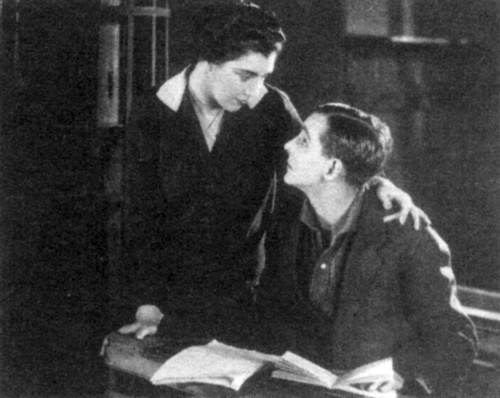 After the triumph of “The Lodger” and the strong reception for “The Ring,” not to mention the delayed release of the earlier “The Pleasure Garden,” Hitch’s last picture of the year was “Downhill.” This was Ivor Novello’s second and final starring role with Hitch, based on a stage play cowritten by Novello under the pen name David L’Estrange. Novello plays a public school boy named Roddy Berwick, a rugby star who has made a pact of loyalty with his roommate, Tim. A young woman who works at their school invites them to the local bakery, where she also works, to dance. Soon, the boys are called before the school’s headmaster. The young woman has made some accusations, and Roddy takes the blame for Tim, who has gotten the girl pregnant (though it’s never said explicitly). Roddy is expelled, and when he arrives home, his wealthy father refuses to believe that he’s innocent. Hurt, Roddy leaves the comfort of his home. He gets a job as a waiter at a nightclub, and becomes infatuated with the star. Roddy inherits some money, and she takes up with him. They are soon married, and Roddy sees that with her spending habits, his inheritance won’t go far. He catches her with her former boyfriend (Ian Hunter, who also appeared in “The Ring”), but when he tries to kick her out, she points out that the apartment is in her name, and so he ends up on the street. He ends up in Marseilles, being paid 50 francs a dance at a sleazy club, then falls ill and winds up in a garrett. Some local sailors learn of his fall from grace and decide to send him back to London. Delirious, he imagines the women from his past mocking him as he crosses the English Channel. Back home again, he wanders the streets of London until he stumbles upon his own house. He is taken in by the butler, and when his parents arrive home for the evening, his father explains that they’ve been searching for him. He’s learned the truth about everything, and begs forgiveness. The film ends with Roddy back at school, playing rugby once more. Hitch’s growing confidence is evident in “Downhill.” He’s internalized the influences of German and Russian film – there are only a few montages, which he deploys judiciously while Roddy is delirious. As in “The Lodger,” Ivor Novello is a treat – he’s charming and convincing, even though he looks rather too old to be a public school boy… and Roddy’s naivete is astounding. Hitch’s ability to tell the story visually continues to grow here – there are very few intertitles in the film, and several of those set the scene by saying things like “The World of Illusion,” rather than telling the story. Hitch also visually echoes the plot’s downhill momentum throughout the film with moments in which Roddy literally goes downhill, by walking down stairs, descending on an escalator, or pushing the down button in an elevator. The other visual that struck me while watching “Downhill” was Hitch’s use of the walk of shame in the first third of the movie – there are several instances of Roddy slowly walking down a long hall as he considers his plight, and what he must do to salvage his future. Ultimately, “Downhill” isn’t much of a story – like many silent films, it’s a bit simplistic. But the visuals that Hitch creates are distinctive and memorable, and that makes it more than worth watching. After Alfred Hitchcock filmed his first picture, “The Pleasure Garden,” in 1925, and before his first triumph with 1927’s “The Lodger,” Hitch made another movie: “The Mountain Eagle.” Filmed in 1926, this is only completed, full-length Hitchcock feature that seems to be really and truly lost to the ages (not counting some shorts films and a couple of other oddities). However, we are fortunate enough to have some publicity shots to look at, as well as some information the film. It was a co-production of Gainsborough Pictures and the German Münchner Lichtspielkunst AG; it had the same cameraman as both “The Pleasure Garden” and “The Lodger,” Gaetano Ventimiglia, with Alma Reville on board as assistant director. This looks like it is from the start of the movie, as Beatrice gets familiar with young Edward, the shopkeeper's son. Set in the hills of Kentucky (yet shot in the snowy mountains of Austria), the local teacher, young Beatrice, is interested in a young man who is physically disabled. His father, a local shopkeeper, confronts Beatrice about it, as he wishes to protect his son. He puts the moves on her himself, and when Beatrice rejects him, he accuses her of abusing his son. On learning this, the son flees the village, followed by Beatrice. She meets a hermit called (I’m not making this up) John “Fear O’God” Fulton. Malcolm Keen, who played the hermit John "Fear O'God" Fulton. In order to dodge the shopkeeper’s charges of promiscuity, Beatrice marries Fulton. She eventually falls in love him Fulton, and they have a child together. Meanwhile, the shopkeeper claims that Fulton murdered his missing son. After a year in jail, Fulton escapes and manages to flee into the hills to take refuge with his new family, but on discovering that Beatrice is ill, he returns to the town for a doctor, only to learn that the son has reappeared. The shopkeeper is accidentally killed, and Fulton is at last able to live at peace with his family. Hitchcock dismissed this film, although reports say that he was ill during the making of it, which may be part of the reason for his disdain. Perhaps the best images from the production are these two shots of the crew; I can’t spot Hitch in the first shot, though I’m pretty sure that one woman about two-thirds of the way to the left has to be Reville. And that rope connecting them all is impressive, too! The other shot of the crew is a classic; young Hitch’s energy and enthusiasm is apparent, as is Reville’s intense devotion to her craft. That has to be Ventimiglia behind the camera, of course. I wrote a bit about “The Pleasure Garden” before – how it is Hitchcock’s first completed film, and how the production was stricken by troubles – and now, thanks to the generosity of reader Mark Orr, I’ve watched it, although it’s currently only available on DVD in the U.K. The film was shot in 1925 and previewed for the press, but not officially released until 1927, when “The Lodger” had become a hit. So, what did I think? Well, as expected, it suffers in comparison to the later films that I’ve watched, “The Lodger” and “The Ring.” The storytelling is competent but not particularly flashy, except here and there. The story itself is about a young chorus girl, Patsy (Virginia Valli), who works at a club called The Pleasure Garden and shares a flat with a more experienced chorus girl, Jill. Jill is engaged to Hugh, who works on an unnamed tropical island and only comes home occasionally. Hugh introduces Patsy to his co-worker, Levet. When Hugh returns to work and Jill takes up with a phony prince, Patsy finds solace in Levet’s arms. Levet wants to marry Patsy, but feels it would be unfair to her, as he is going to return to the island himself in only a few weeks. Patsy wants to marry him, though, and before you know it they are wed, and on a honeymoon in Italy, where Levet quickly reveals his true nature as an insensitive, impatient person. He leaves for the island, and Patsy returns to The Pleasure Garden. Weeks go by with no word from Levet, leaving Patsy forlorn. Finally, a letter arrives, and Levet claims he’s been too sick to write. Patsy drops everything to join Levet, thinking he needs to be nursed back to health, but on arrival she finds Levet shacked up with a native girl. Patsy leaves him and finds Hugh in his nearby cabin, actually quite ill himself. Meanwhile, Levet tries to break things off with the native girl, but resorts to murder to get rid of her. He finds Patsy nursing Hugh and vows revenge, then drags Patsy back to his own cabin. He is haunted by the image of the dead girl, and tries to kill Patsy with a sword. Another friend, sent by Hugh, shows up and shoots Levet dead. Patsy runs to Hugh’s side, and they realize that they were made for each other after all. The movie ends with them arriving back at Patsy’s flat, where they tell Patsy’s landlords that they are engaged to be married. As I knew going in, “The Pleasure Garden” is a melodrama, although the bravura opening sequence and, at the end of the movie, the murder and haunting liven things up a bit. Miles Mander’s performance as Levet may be the best thing about the movie – he is charming at first, then sullen, then crazed. Virginia Valli was the picture’s big star, but really, she isn’t particularly wonderful. There’s also a surprisingly racy aspect to the movie, in scenes where Patsy and Jill undress, and where Levett and Patsy kiss passionately in bed during their honeymoon. did his budding relationship with Alma Reville, his assistant director. Regardless, “The Pleasure Garden” showed Hitchcock to be a strong enough director that his boss, producer Michael Balcon, allowed him to continue honing his craft, and the success of “The Lodger” paved the way to Hitch’s legacy as The Master of Suspense.